The Arctic refuge would provide less than a six-month supply of oil - which would not be available for ten years. According to the 1998 U.S. Geological Survey study, the mean estimate of economically recoverable oil from the Arctic refuge is 3.2 - 5.2 billion barrels. This is equivalent to the amount of oil the U.S. consumes in about six months. According to the Congressional Research Service, production from the Arctic refuge would not come on line for ten years or more (RS21030, October, 1, 2001). The much higher figure of 10.4 billion barrels of available oil often quoted by the Bush Administration and others refers to the estimated amount of technically (not economically) recoverable oil in the coastal plain of Arctic refuge. Even using this inflated estimate, the Arctic refuge would provide less than one year of oil for the U.S. The Arctic refuge would not reduce U.S. dependence on foreign oil. According to a March 12, 2001 report issued by the Energy Information Administration (EIA), "the increased production from the Arctic National Wildlife Refuge is projected to reduce the net share of foreign oil used by the U.S. in 2020 from 62 percent to 60 percent." We cannot drill our way out of dependence on foreign oil. According to the EIA, the U.S. currently relies on foreign imports for about 56 percent of its oil and domestic production accounts for 44 percent. The U.S. consumes about 19 million barrels of oil daily. Of this consumption, domestic production accounts for 8.1 million barrels of oil a day; 10.9 million barrels of oil per day is imported. The U.S. has approximately three percent of the world's oil reserve but consumes 25 percent of the world's oil. This is compared to 65 percent of the world's total reserve held by the OPEC nations. The area of the Arctic National Wildlife Refuge that the proposed drilling is to take place is an area designated as 1002. 1002 Area is only 10% of the total Refuge acreage, it includes most of the Refuge's coastal plain and arctic foothills ecological zones. The 1002 Area contains just 4% of Alaska's coastal plain and foothills zones, but is a crucial environmentally pivotal area. The 1002 Area is critically important to the ecological integrity of the whole Arctic Refuge, providing essential habitats for numerous internationally important species such as the Porcupine Caribou herd and polar bears. The compactness and proximity of a number of arctic and sub-arctic ecological zones in the Arctic Refuge provides for greater plant and animal diversity than in any other similar sized land area on Alaska's North Slope. In 1987 a Legislative Environmental Impact Statement (LEIS) that described the potential impacts of oil and gas development was submitted to Congress. The report concluded that oil development and production in the 1002 Area would have major effects on the Porcupine Caribou herd and muskoxen. Major effects were defined as "widespread, long-term change in habitat availability or quality which would likely modify natural abundance or distribution of species." Moderate effects were expected for wolves, wolverine, polar bears, snow geese, seabirds and shorebirds, arctic grayling and coastal fish. Major restrictions on subsistence activities by Kaktovik residents would also be expected. 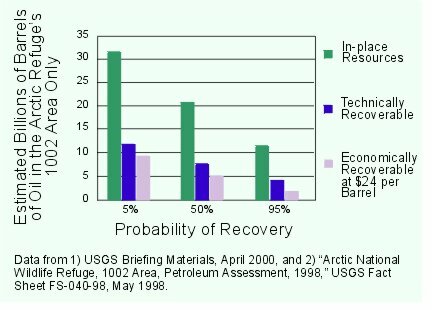 The United States Geological Survey estimated in 2000 that, assuming a price of $24 per barrel, there is a 95% chance of finding 1.9 billion barrels (BBO) of economically recoverable oil in the Arctic Refuge's 1002 Area; a 5% chance of finding 9.4 BBO; and a 50% chance of finding 5.3 BBO. Map of northern Alaska and nearby parts of Canada showing locations of the Arctic National Wildlife Refuge (ANWR), the 1002 area, and the National Petroleum Reserve—Alaska (NPRA). Locations of known petroleum accumulations and the Trans-Alaska Pipeline System (TAPS) are shown, as well as summaries of known petroleum volumes in northern Alaska and the Mackenzie River delta of Canada. BBO, billion barrels of oil (includes cumulative production plus recoverable resources); TCFG, trillion cubic feet of gas recoverable resources. Americans use 19 million barrels of oil each day, or 7 billion barrels of oil per year. There is, therefore, a 50% chance of finding a 9 month's supply of oil in the 1002 Area. "This is the place for man turned scientist and explorer; poet and artist. Here he can experience a new reverence for life that is outside his own and yet a vital and joyous part of it." The Arctic National Wildlife Refuge is a vast and beautiful wilderness, one unique in North America. 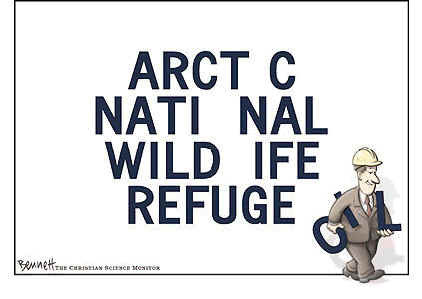 Unique because it has a full range of arctic and sub-arctic ecosystems. Unique also because the systems are whole and undisturbed, functioning as they have for centuries, largely free of human control and manipulation. Inupiat Eskimos and Athabascan Indians live in this place, following their ancestors who survived here for generations. One of the world’s most remote natural areas, the Arctic Refuge is a frontier--perhaps America’s last--like those that helped shape America’s distinct cultural heritage. Here conditions exist like those that once surrounded and shaped us--as individuals and as a Nation. The move to protect this corner of Alaska began in the early 1950s. Visionary conservationists George Collins, Lowell Sumner, and Olaus and Mardy Murie, considered founders of the Refuge, launched a spirited campaign to permanently safeguard the area. Their effort mobilized thousands, including conservation leaders, sportsmen’s groups, garden clubs and individuals. The effort succeeded. The Arctic National Wildlife Range was established in 1960. This designation was a promise to the American people to preserve the area’s “unique wildlife, wilderness and recreational values.” Twenty years later, Congress passed the “Alaska Lands Act.” The Act renamed the area and more than doubled its size. Today the Arctic National Wildlife Refuge includes nearly 20 million acres (the size of South Carolina), three Wild rivers, and the largest designated Wilderness (eight million acres) in the National Wildlife Refuge System. 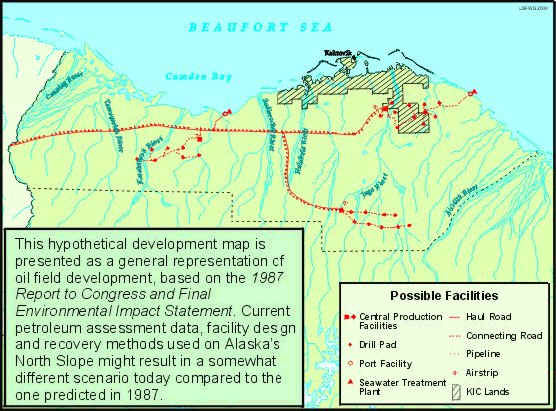 The Act also authorized a study of the oil and gas potential of the northern part of the Refuge -1002 Area-. This touched off an epic conservation battle that continues to this day. The majestic Brooks Range, with peaks and glaciers to 9,000 feet, dominates the Refuge. These rugged mountains extend east to west in a band 75 miles wide, rising abruptly from a flat, tundra-covered plain. This treeless expanse is cut by numerous braided rivers and streams. South of the continental divide, rivers wind serpentine courses through broad, spruce-covered valleys dotted with lakes and sloughs. The Refuge includes an array of landscapes and wildlife habitats--from the boreal forest of the Porcupine River uplands . . . to the foothills and slopes of the Brooks Range . . . to the arctic tundra of the coastal plain . . . to the lagoons and barrier islands of the Beaufort Sea coast. Together these areas contain hundreds of species of mosses, grasses, wildflowers, shrubs and other plants. The ground lies permanently frozen below much of the Refuge. This impenetrable “permafrost” layer causes many areas to remain wet during the summer. Plants grow rapidly with 24-hour daylight, but the growing season is short. These factors make the Refuge a fragile area easily impacted by human activities. In this most northern of refuges, plant communities take a long time to recover from disturbances. The Refuge contains the greatest wildlife diversity of any protected area in the circumpolar north. The animals are well adapted to the arctic, able to withstand a range of extreme environmental conditions. Some species are at the northern limit of their range. Many depend on the Refuge’s undisturbed wilderness. Nearly 180 species of birds have been seen on the Arctic Refuge. They come from four continents to breed, rest or feed. A majority nest on the Refuge. 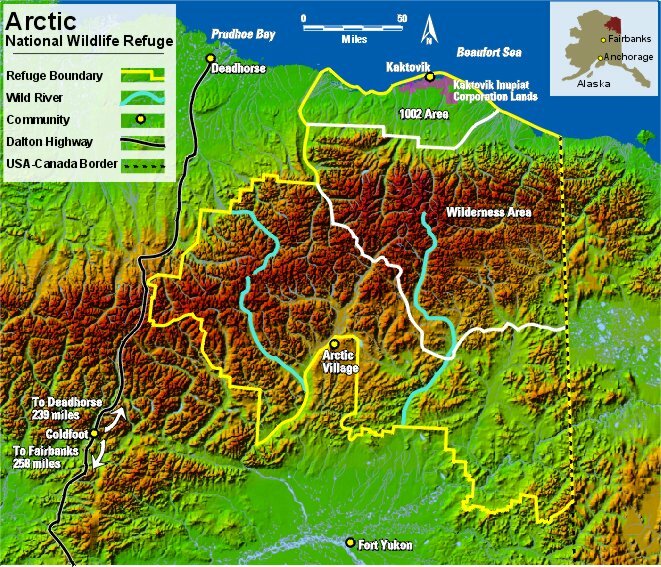 First set aside in 1960 to preserve its unique values, the Refuge more than doubled in size with passage of the Alaska National Interest Lands Conservation Act in 1980. Today the Refuge encompasses nearly 20 million acres, an area about the size of South Carolina. Nesting and related activities occur April to July, depending on the species. Owls and jaegers cruise low over the tundra hunting for lemmings. Golden eagles, rough-legged hawks and peregrine falcons build aeries high on cliffs. Loons and oldsquaw sound their yodeling calls from coastal lagoons. Pairs of tundra swans dine on submerged plants in the quiet lakes of river deltas. Sandpipers, plovers and sparrows tend well-camouflaged nests on the open tundra. In July, ducks and shorebirds start gathering in lagoons and lakes to prepare for migration. In late August, thousands of snow geese arrive on the coastal plain to feed on cottongrass, building fat reserves for their journey south. By mid-September, most birds depart for wintering areas in Asia, Africa, South America, the South Pacific and every state except Hawaii. Ptarmigan, ravens, gyrfalcons, dippers and a few other species remain to winter in the long arctic night. Forty-five species of mammals live on the Refuge--thirty-six occur on land, nine are marine species that can be seen along the coast. Some are herd animals, many are not. Some migrate, most do not. All rely on the unconfined open spaces of the Refuge. Each year the Porcupine caribou herd journeys more than 800 miles to and from its ancestral calving grounds. In May and June, the herd migrates to the coastal plain to give birth. By early July, the caribou leave for wintering areas south of the Brooks Range. Groups of agile Dall sheep roam the mountainsides, grazing tundra plants and watching for predators. Moose browse willow thickets near rivers and lakes. Herds of shaggy muskoxen forage year-round on the coastal plain, mostly along rivers. 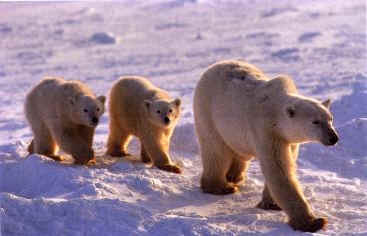 Polar bears dig maternity dens in snow drifts during winter, returning to the sea ice in spring to hunt seals. Age-old struggles for survival continue on the Refuge just as they always have. Grizzly bears chase ground squirrels, digging like backhoes into their burrows. Wolf packs pursue caribou and moose, seeking those unable to keep up or defend themselves. Lynx zig-zag through the forest after snowshoe hares. Weasels and fox pounce on voles and lemmings. Lone wolverines scavenge the leftovers. The Refuge provides habitat for 36 species of fish, mostly in the rich coastal lagoons. Several coastal plain rivers contain arctic char and grayling. Many rivers south of the mountains support grayling, northern pike and whitefish. The Arctic Refuge is recognized as one of the finest examples of wilderness left on the planet. It is among the last to be visited by modern man and among the least affected by his doings. It’s a place where the wild has not been taken out of the wilderness. Untold mountains, diverse wildlife and a wealth of habitats give this unspoiled national treasure first-rate cultural, scenic, scientific and experiential values. Values that are ageless. Values that make the Refuge a national symbol of wilderness. The Refuge is a place that changes those who visit. It’s a place that is precious to millions who never will. It’s a place whose existence strengthens our awareness of and sense of responsibility for the natural world. The entire Refuge is managed to maintain its natural condition, diversity of wildlife and habitats, scenery and other special values. Management efforts focus primarily on surveys, research studies, monitoring and education. Refuge employees survey wildlife and plants to determine their abundance and productivity. The information helps ensure the long-term health of wildlife populations and habitats while allowing for human use. Employees cooperate with others on research, gathering information about the Refuge and the effects of human disturbance in the arctic. They seek to minimize the impacts of human activities on refuge resources, values and visitors through education, monitoring and law enforcement.